Add a 10/100Mbps Ethernet port to a desktop computer through a PCI Express slot. This PCI Express based 10/100 Ethernet Card provides a simple way to connect a PCIe enabled server or workstation to a 10/100 Ethernet network and offers a broad range of features and functions, including support for both Full and Half Duplex operation as well as Wake On LAN (WOL) Power Management.The PEX100S Ethernet Card includes both standard and low profile brackets and is compatible with most mATX (Slimline) and ATX system form factors, and features Auto MDI/MDIX automatic configuration, which helps to simplify installation and configuration. 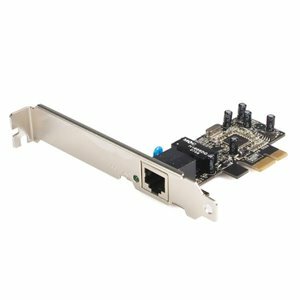 This PCI Express based 10/100 Ethernet Card provides a simple way to connect a PCIe enabled server or workstation to a 10/100 Ethernet network and offers a broad range of features and functions, including support for both Full and Half Duplex operation as well as Wake On LAN (WOL) Power Management. The PEX100S Ethernet Card includes both standard and low profile brackets and is compatible with most mATX (Slimline) and ATX system form factors, and features Auto MDI/MDIX automatic configuration, which helps to simplify installation and configuration.